Landscape Impressionism and Art, are some of my favorite things. This page is dedicated to landscapes and impressionism art. I love both and when I combine them, it is utter joy. I have made a number of these lately for a project called City Garden. I really got in touch with my impressionist skills and I rediscovered the art of positioning a landscape. I can muddy up a piece by overworking but I have gotten a handle on that lately. All in all, nothing but improvement in my landscape impressionist art. colors with an emphasis on the effects of light. They use color to define shadows and highlights instead of the typical neutrals like black, white and grey. Impressionists convey effortless spontaneity in their art but really, these works were painstakingly created compositions. The carefree appearance of Impressionism paintings gave rise to a carefree way of viewing life or at least, moments in life. The average people of Monet’s time enjoyed seeing their daily lives depicted in the paintings of the Impressionists, they called it modern and appropriate. They felt a sense of self-importance that was missing and badly needed. 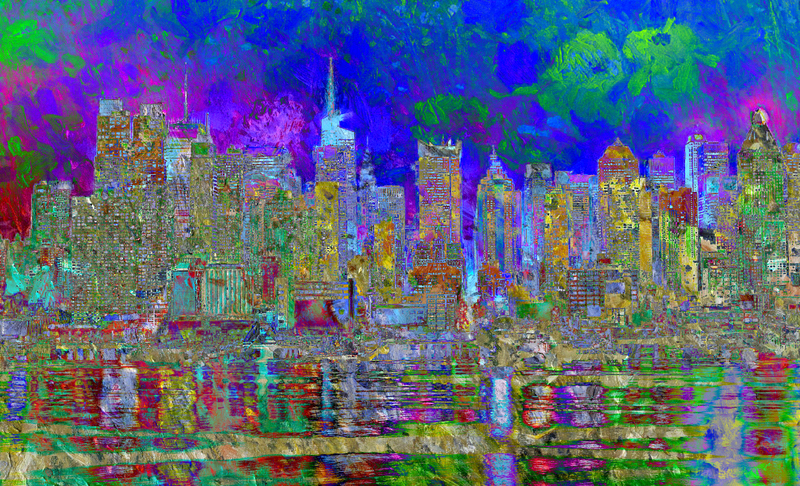 The featured artwork above is landscape impressionism art called City Surprise and belongs to the City Garden Art Series. To see more landscape or impressionism art, visit Landscape Art Gallery or the Impressionism Art Gallery. I’ve made lots of landscape art, check out my Landscape Art Gallery to see them all. I create them with computer software, mathematics and a grand imagination. Impressionism style art is my first love, see mine in the Impressionism Art Gallery. I always fall back on impressionists when in need of inspiration. I sell my landscape impressionism art prints in the secure online store Fine Art America. You’ll find prints of landscapes, cityscapes, abstracts, portraits and more.